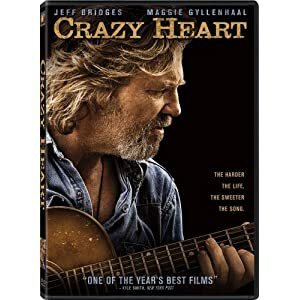 Bridges ably does his own guitar playing and singing, another reason Crazy Heart is a gift to those who have long appreciated his talents. 111 min. Fox Searchlight Pictures. Director: Scott Cooper. Cast: Jeff Bridges, Maggie Gyllenhaal, Robert Duvall, James Keane (II), Anna Felix. There’s one reason Crazy Heart is a must see: Jeff Bridges. The veteran actor has done consistently great work for decades, but this intriguing meander down the borderline of the music biz and “real life” offers Bridges a role that plays especially well to his strengths as a humanist naturalist with an inborn gift for entertainment. Bridges plays Bad Blake, a faded country-western music star relegated to playing dives like a bowling-alley bar. He treats his chronic weariness with chronic drinking, defensive pleasantries, and one-night stands. These escapes are understandable: it’s hard to face up to the disappointments that have brought him here, and it’s easier to blame someone else—his manager, perhaps, or his one-time friend and colleague Billy Sweet (Colin Farrell), currently living the music star life that has slipped from Bad’s fingers. Travelling America in his beat-up ’78 Chevy truck, Bad would rather be left alone to anesthetize himself before, during, and after gigs, but he agrees to an interview with a hopeful music journalist named Jean (Maggie Gyllenhaal). More than usually attracted to the potential lover in his midst, Bad seduces her and realizes that, for the first time in a long time, he’s not interested in leaving his conquest behind. Though not disinterested in a relationship, she turns out to be a single mother understandably wary about the effect Bad might have on her son, especially should he succumb to drinking in the boy’s presence. While Bad attempts to woo Jean in the long term, he finds himself wooed by Billy Sweet, whose generosity—or is it guilt?—toward his former friend and mentor takes the form of an ungainly olive branch: the chance to open for Billy on his arena tour. Having beautifully established Blake’s state of being, Bridges masterfully plays the strained civility and subtle emotional need in his interactions with Jean and Billy—interactions with the potential to help him out of his rut and thereby change his life forever. 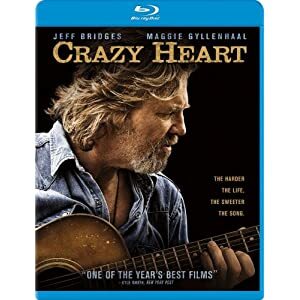 As written and directed by Scott Cooper, Crazy Heart can be obvious and unconvincing at times, but the compensations are so winning that the film’s flaws melt away. There’s Barry Markowitz’s gorgeous landscape photography of Blake on the road, the always welcome Robert Duvall putting in a couple of scenes as a bar-owning teetotaler (he also co-produces) and plenty of good music, supervised by music producer/writer/performer T-Bone Burnett (O Brother, Where Art Thou?). Bridges ably does his own guitar playing and singing, another reason Crazy Heart is a gift to those who have long appreciated his talents. It’s a sure bet Bridges will show up at this year’s Oscars—his performance here stands tall as one of the best of the year. Fox hustles out Crazy Heart in good time to capitalize on Jeff Bridges' Oscar win, though the slim extras offer little context for that award-winning performance. Picture quality is excellent, with Blu-ray certainly the best way to appreciate Barry Markowitz's lovely photography from the confines of a home theater. The accurately rendered, warmly boosted colors come across nicely, and though there's a hint of grain to keep the proceedings from seeming too processed, detail and clarity are strong. The DTS-HD Master Audio 5.1 surround mix nicely services the film's frequent music sequences. In bonuses, you'll find ten "Deleted Scenes and Alternate Music Cuts" (28:22, SD), welcome but disappointingly not presented in HD. The scenes offer at least one nice surprise left on the cutting room floor, in addition to the musical focus of the alternate takes. "Jeff Bridges, Maggie Gyllenhaal & Robert Duvall on What Brought Them to Crazy Heart" (3:02, HD) is likewise welcome, but the three-minute running time is a dead giveaway as to the promo featurette's shallow depth. There has to be more interview material (pay Charlie Rose, fer gosh sakes! ), and a commentary track would seem a no-brainer. Anyway, the disc is rounded out by the film's "Theatrical Trailer" (1:55, HD) and a Digital Copy on a second disc. All site content © 2000-2019 Peter Canavese. Page generated at 04/21/2019 02:06:54AM.